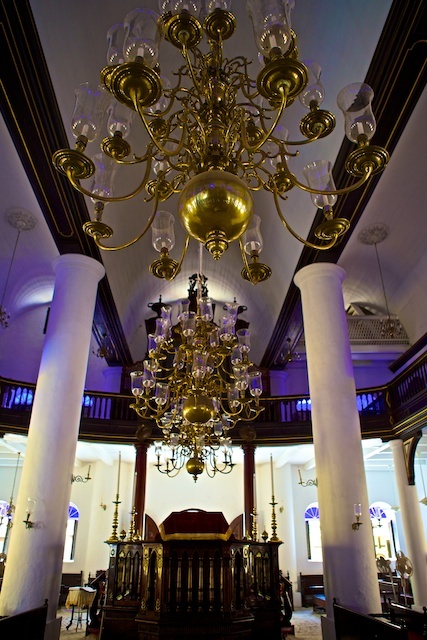 The shifting sands on the floor inside the Western Hemisphere’s oldest continuously operating synagogue Mikvé Israel-Emanuel in Willemstad, Curaçao posed some unique challenges. 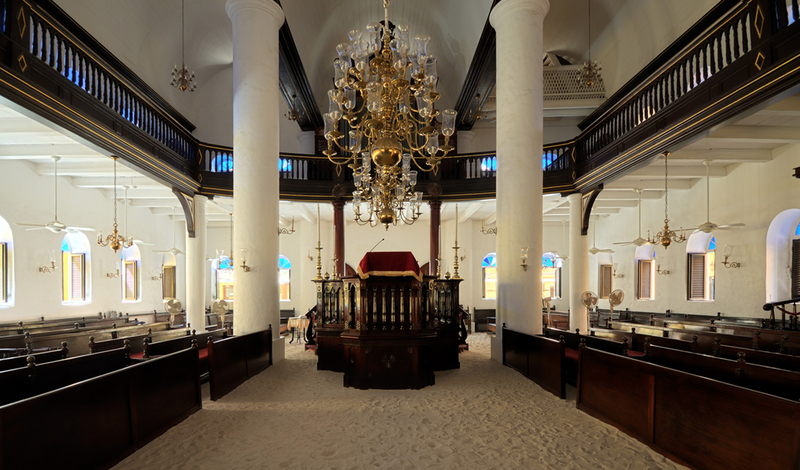 Covering the floors of the sanctuary and the mezzanine, the sand parted with every footfall, making it harder for eight University of Miami School of Architecture students to document every cornice and crevice of the synagogue, built nearly 300 years ago by Dutch Jews whose descendants fled the Spanish Inquisition. Yet Kramer and the other architecture students (L-R Olivia, Joshua Kleinberg, Amanda Arrizabalaga, Xiangyu “Jack” Shao, Daniella Huen, and Hector Valdivia Arrieta)—who spent the first week of the fall semester on this Dutch Caribbean island just north of Venezuela—had no complaints. They may not have known exactly what they were getting into when they signed up for Professor Jorge L. Hernández’s elective design studio in historic preservation, but the arduous process of creating the most comprehensive and accurate architectural drawings of the oldest surviving synagogue in the Americas was an exhilarating learning experience with innumerable rewards. Divided into a floor plan team and a longitudinal sections team, the students spent six long, hot days measuring and sketching the un-airconditioned space imbued with serenity and history and bathed in cobalt light. The color filtered through dozens of blue stained-glass windows that, depending on the time of day, splashed the sills, the white walls, the mahogany benches, and the mysterious, ubiquitous sand with its heavenly blue hue. A symbol of Jewish resilience in the face of relentless persecution, the sand is said to be a reminder of Spanish Jews who muffled the sound of their footsteps when praying in secret during the Inquisition, or of Moses wandering in the desert after leading his people out of slavery in Egypt. But aside from its tranquil, sound-absorbing presence, the uneven sand was a burden for the students responsible for establishing a datum line, the vertical reference point from which all measurements start, and on which all architectural drawings depend. Guided by Ricardo Lopez (pictured below), assistant director of the School of Architecture’s Center for Urban and Community Design, who teaches a class on the standards for surveying historic American buildings, the students used lasers, levels, plumb lines, tape measures, string, and even a translucent, flexible tube filled with water to set the perfect line. Lopez borrowed the simple tool from Santiago, Cuba, where he, Hernández and Associate Professor Carie Penabad led another studio class that documented Santiago’s Church of Santa Lucia. 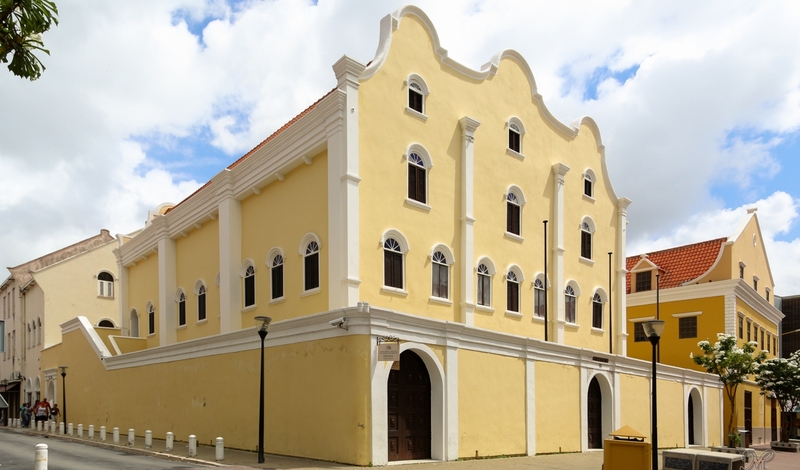 Karen Mathews, Assistant Professor of Art and Art History, who researched the synagogue in Curaçao’s archives, also participated in the documentation of the 1701 Catholic church, which is among a dozen that, with the Cuban-born Hernández’s help, were listed as cultural heritage sites by the World Monuments Fund. By late afternoon, a triumphant yell could be heard from the mezzanine, where women congregants were once segregated from the men who sat below on the first level. “Finito!” exulted Daniella Huen, when she and fellow fifth-year student Jack Shao and fourth-year Julia Murdoch finally finished establishing the datum line, painstakingly marked with dots on masking tape about five feet above the shifting sands on both floors.